Experience the lavender blossom for all senses in secluded nature paradises situated away from popular tourism. An adventure holiday for nature lovers in a small group of maximum ten participants - “among friends“ - with a competent german travel guide, with a maximum amount of individuality led by two german nature guides. We speak German and English with our participants, according to their preferences. Our base accommodation near Digne-les-Bains in southern France is an ensemble of two magical, tastefully decorated manors in a fantastic, isolated location on a small hill in absolute solitude. An extensive and idyllic garden and a large swimming pool invite you to contemplative relaxation after our day trips. Due to its high elevation there is always a refreshing breeze which provides a pleasant cool temperature at night. 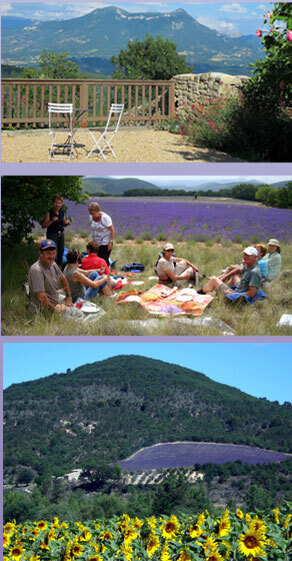 Starting our voyage here, our nature guides - knowledgeable experts of secluded lavender paradises - will take you on day trips with easy, relaxed hikes including a picnic. Depending on the fitness of the participants, adequate room for relaxation and contemplation will be provided. Within a sea of lavender, sage, poppy, sun flowers, grains and herbs, you will experience a concert for all senses in the Haute-Provence. The landscape of the Provence with its indescribable color diversity, its pleasant air full of scents and smells and its incomparable shining, bright blue sky will fascinate and bewitch you. With these top conditions, one disconnects from daily routines, decreases stress…clears the mind…discovers a neutral body-mind balance… creates room for creativity and inspiration … sheer happiness! You want to give someone a really special gift? What about a voucher?